Please note that online registration is closed after August 20, 2014, but you can register onsite at the Hilton lower level at the registration desk beginning on Tuesday, September 2nd at 5:00 PM. If you have any questions please contact YesEvents at (800) 937-8728 or by email at iusinfo@yesevents.com . Please see hours of operation for onsite registration to the right. It is recommended that all attendees register online via the link below. This ensures efficient processing of your registration information and allows us to quickly confirm your reservation. Should you require a paper registration form, please download the form below. The form contains information on how to submit your registration info via mail or fax. * Registration includes access to all sessions, exhibits, welcome reception, conference program, and password-controlled Internet access to the conference proceedings for a period of one year for downloading the papers. Short courses are not included. **One Day Registration includes password-controlled Internet access to the conference proceedings for a period of one year for downloading the papers and tickets to the Reception (if it coincides with the day of reception) but it does not include tickets to Banquet. The Banquet is optional and is $90. ***Short Course Only Registration does not include access to conference sessions, tickets to the Banquet, Reception, and exhibits. It includes password-controlled Internet access to the conference proceedings for a period of one year for downloading the papers. ****Guest registration includes the Thursday night reception and three continental breakfasts on Thursday, September 4rd, Friday, September 5th, and Saturday, September 6th. The Friday banquet is not included in the guest registration. The Banquet is optional and is $90. Guests are NOT allowed to attend any technical sessions except for the Thursday morning plenary session. Only ages 10 or older need to register. Life Member is defined by IEEE as at least 65-year old and the age plus years of IEEE membership should be equal or greater than 100. 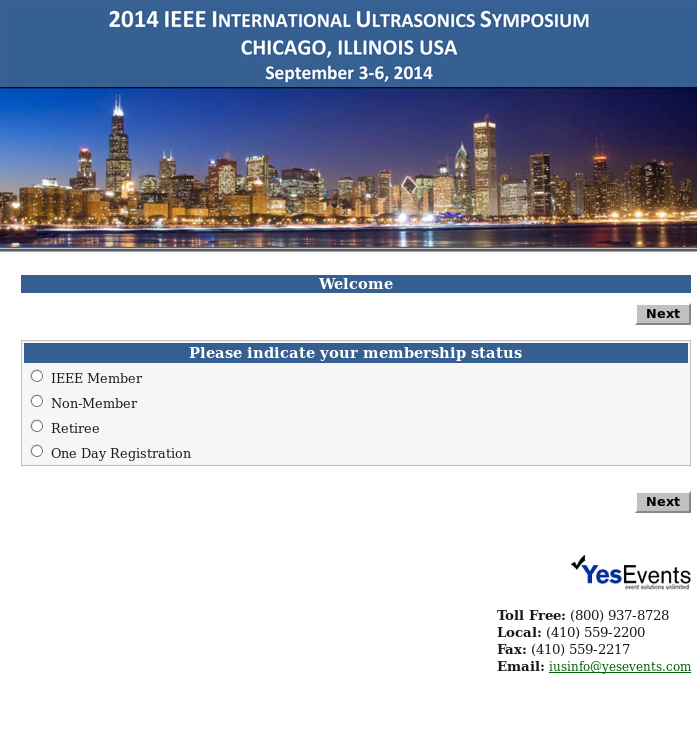 Life members should show their IEEE Life Member card or evidence of Life Membership when getting registration materials. Refunds: General attendees (non-authors) are eligible for a registration refund if the refund is requested in writing prior to August 1, 2014 and will incur a processing fee of $50.Â There are no registration refunds after 1 August 2014. Authors who have uploaded their papers are NOT entitled to any refunds.